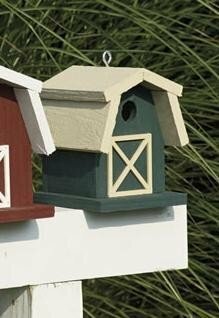 Some things are just better when they're kept simple - and this small barn-style bird house is a perfect example. Boasting rustic elements carefully hand-built by dedicated Amish craftsmen, this bird house shows all visitors that there's real value in doing things the right way. The details on this house, such as the stable door outline and beautiful pitched roof, promise season upon season of warmth and enjoyment. Choose from a rainbow of colors to find your perfect fit. If you've got any questions at all, please don't hesitate to give us a call - we would love to hear from you.